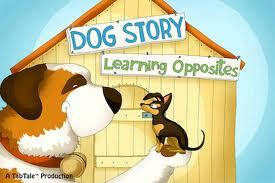 Dog Story: Learning Opposites is no great work of literature. The interactivity of this eBook kept my 2 year old and me occupied for a very, very long time. You can choose Auto Play or Read to Me. On each page you are presented with simple text like “This dog is big and this dog is small,” with the respective canines pleasingly rendered with manipulatable doggy apparatuses such as bones, food bowls, trees (on which to pee, one would assume), newspapers, doghouses and balls. Each page has a different schtick: a fence becomes a xylophone, flowers fall from the tree, the bones spin around. You can tap on the dogs to see and hear the opposite words. You turn pages by tapping the purple arrows in the bottom corners, and there are buttons at the top left for repeating the narration and removing the text. The narrator has a calming voice and the music isn’t annoying. 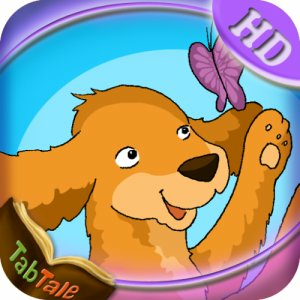 A great free app. Available through iTunes too. Posted on January 12, 2012, in Android, eBook, Review. Bookmark the permalink. Leave a comment.